I sense a very silly crafty project coming on. $ cd ~meri > Craftiness > I sense a very silly crafty project coming on. I’m not sure if I mentioned that G gave my dragons a friend, in the form of Sauron. I’ve got the little collection going on my table in the family room. They hang out with me while I geek and knit. But, Sauron has little feet (who knew?) and is very top-heavy. He tends to fall over unless he’s propped up by his dragony friends. 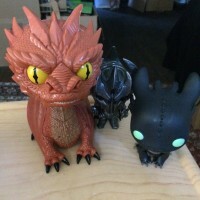 So, I have this incredibly goofy desire to build a dragon pen, complete with coin beds (pennies), and overseer (Sauron). And, in my brain, it’s made out of popsicle sticks. Sometimes, my inner child is not so inner.